Our Horse Drawn Hearse business, established in 2003, specialises in traditional horse drawn funerals for hire to funeral directors and private individuals. We usually use a pair of horses to pull the hearses, but specialise in teams of 4 or 6 horses. As well as black horse drawn hearses, we also have a white horse drawn hearse, which is normally pulled by our stunning greys. In addition to the black and white horse drawn hearses, we can also provide a pink hearse, a silver hearse and gun carriage by special arrangement. Karen has done some very high profile funerals including taking King Richard III to his final resting place at Leicester Cathedral on a gun carriage. Karen has been awarded the British Driving Society Road Driving Certificate for Commercial Operators of Horse Drawn Vehicles for a team of horses, as well as a pair. We try to meet whatever special requirements our clients have for their horse drawn funeral, so please feel free to ring Karen for a quotation for something different. Due to our central location in the East Midlands, we are easily able to offer our services in and around Derbyshire, Nottinghamshire, Leicestershire, Staffordshire, Lancashire, Lincolnshire, Northamptonshire, Warwickshire, the West Midlands (including Birmingham) and Yorkshire,. However, as we are just 15 minutes from M1 Junction 30 and 31, we have easy motorway access to any part of the country and so greater distances are not a problem. We can provide a stunning pair of grey or black horses in an elegant dark blue landau carriage. Have peace of mind that you are in safe hands with experienced drivers and horses. Karen runs a professional yard where the commercial horses are well trained and are held in the same high regard has her world class competition horses. The carriage can be fully enclosed to protect you should the weather be inclement. The hoods fold down to give you a beautiful open carriage to show you and your dress off to the full advantage. For more information go to our Wedding/Proms page. Alternatively ring Karen to discuss your requirements. Karen Bassett is a leading international horse team carriage driver, and has competed as part of the British Team at 8 World Four-in-Hand Carriage Driving Championships. In May 2011, she was featured in the ITV programme 'All the Queen's Horses', presented by Alan Titchmarsh. On March 22nd 2015 Karen had the great honour of taking King Richard III on his final journey on the gun carriage through the city centre of Leicester to the Cathedral. She began carriage driving at the age of 8 and started driving a pony team at the age of 12. Since 1980, she has won the National Four-in-Hand Pony Team Championship 8 times, the National Four-in-Hand Horse Team Championship 5 times and is the 2011 and 2014 National Four-in-Hand Pony Team Champion. At Saumur in 1995, Karen made history by becoming the first lady ever to win an International Four-in-Hand Carriage Driving competition. A record she still hold to this day. In 1996, Karen was part of the British Team when they won a Bronze Medal at the World Championship at Waregem in Belgium, and finished 12th in the individual placings. 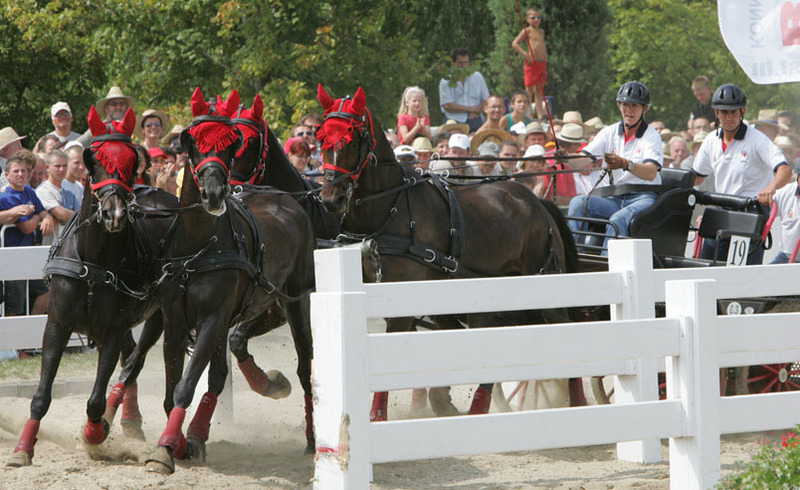 The 2004 World Four-in-Hand Carriage Driving Championship was a good year for Karen. She finished 12th overall, was the highest placed British driver and was the Leading Lady Driver. At the 2006 and 2008 World Four-in-Hand Championships, Karen retained her title as the Leading Lady Driver. Still to this day Karen is the most successful lady driver in the world.